‘Empire, Socialism and Jews V: The Postwar Years’ is the concluding international conference in a series that began in 2012 as a collaboration between the Verein für Geschichte der ArbeiterInnenbewegung (Austrian Labor History Society, VGA) and Duke University’s Council for European Studies and Center for Jewish Studies. It has expanded to include the Internationales Forschungszentrum Kulturwissenschaften | Kunstuniversität Linz in Wien (International Research Center for Cultural Studies | University of Art and Design Linz in Vienna, IFK), the Ludwig Boltzmann Institut für Geschichte und Gesellschaft (Ludwig Boltzmann Institute for History and Society, LBIGG), the Wien Museum, as well as several other organizations and the web journal Religions. The project endeavors to rewrite the Empire back into Austrian national history by recalling the lost Socialist imperial tradition of post-national federalism and the Jewish love story with imperial Austria, as well as nostalgia for multicultural Central Europe. The recovery of these imperial traditions should both enable a long-term (longue durée) Austrian national narrative joining Empire and Republic and open up avenues for new thinking on contemporary European Austria. Previous workshops addressed pre-WWI Austria and Interwar Austria. 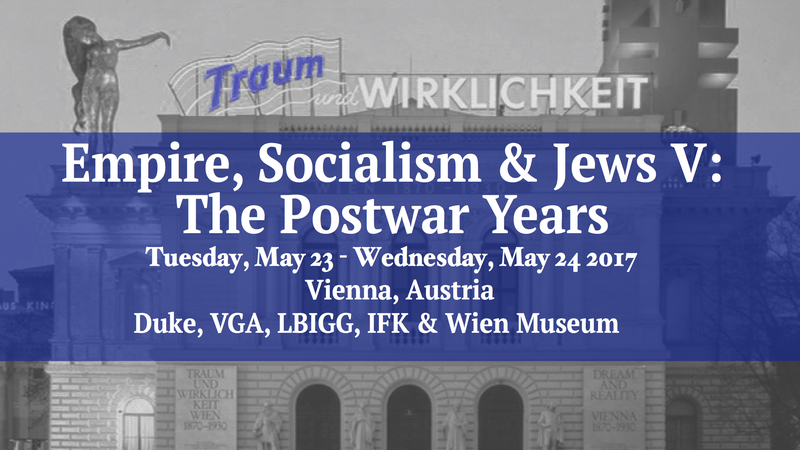 The present workshop tracks the imperial legacy among Socialists and Catholics during the Cold War Years, highlights the discovery of the Wiener Moderne in the 1980s through joined American, Austrian and Central European efforts, and discusses the permutations of Vienna 1900 in Austria over the recent decades. The conference concludes with a reconsideration of Chancellor Bruno Kreisky as the “last emperor”. At the end of the conference, proceedings will be published in an edited volume of Religions. Copyright © 2019 Empire, Socialism and Jews V: The Postwar Years. Powered by WordPress and Saga. Empire, Socialism and Jews V: The Postwar Years is powered by WordPress at Duke WordPress Sites. Please read the Duke Wordpress Policies. Contact the Duke WordPress team.